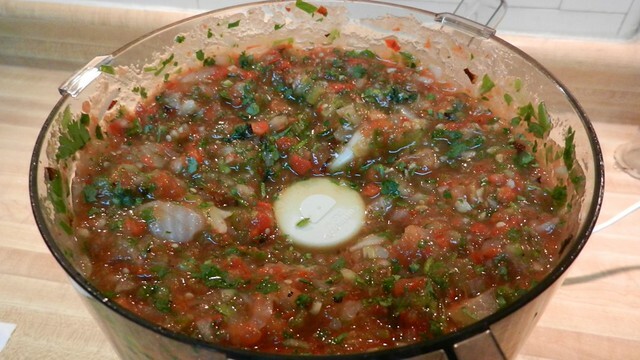 For years when I made homemade salsa I just put a bunch of tomatoes, onions, cilantro, lime, garlic and jalapenos in a blender and hit the “chop” button. 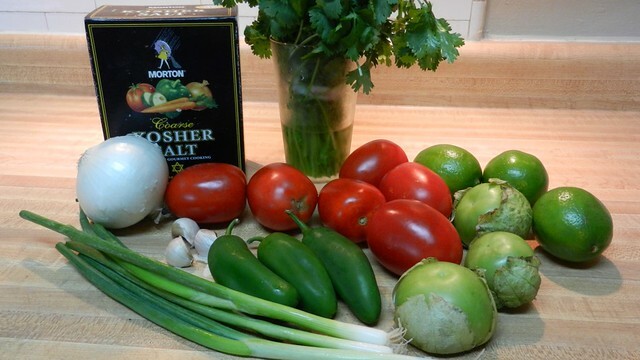 Then one of my fantasy football and real life buddies Josh post his — or more accurately, his mother’s — recipe for a roasted salsa. It was a revelation. Of course I needed to put tomatillos in my salsa. So obvious, especially since I’ve been putting them in vegetable soup for years. And of course, why wasn’t I roasting the vegetables I made them into a salsa? Did I even know anything about salsa at all? After you’ve removed the seeds from the tomatoes and the jalapenos, slice the tomatillos in half and roughly chop the onion. 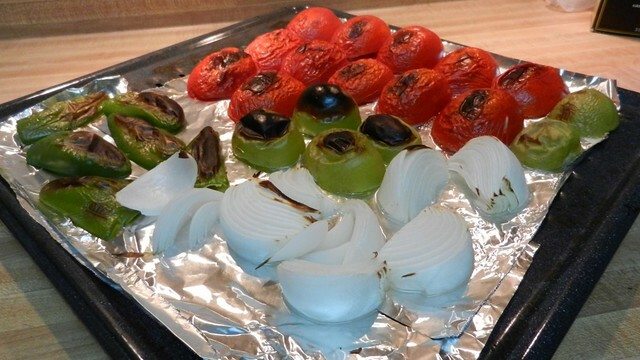 Lay on a foil lined pan and either grill or heat under a hot broiler. 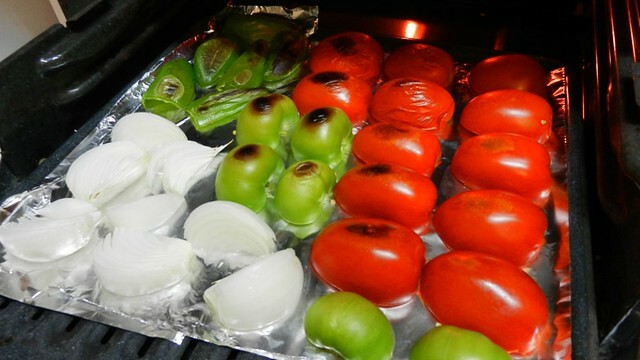 Grill until the tomatoes have wilted and you have a good char on all of the vegetables. Set aside to cool for a couple of minutes. Toss in a blender or food processor (or chop by hand) the roasted vegetables, the scallions, half a bunch of cilantro and 1-2 teaspoons of salt. Chop to desired consistency. I like a chunky salsa, but you can see in Josh’s recipe, he purees it smooth. You could stop here and have an amazing salsa, or you can keep going and have an even more amazing salsa. Up to you. Oh, so you want an amazing-amazing salsa? And then add some more salsa. 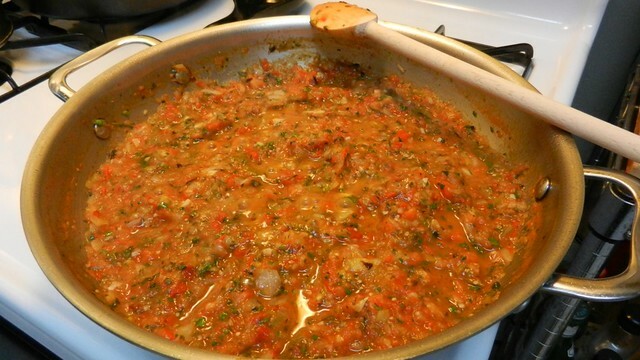 Keep repeating until you’ve added all of your salsa to the pan and cook until thickened, stirring frequently. 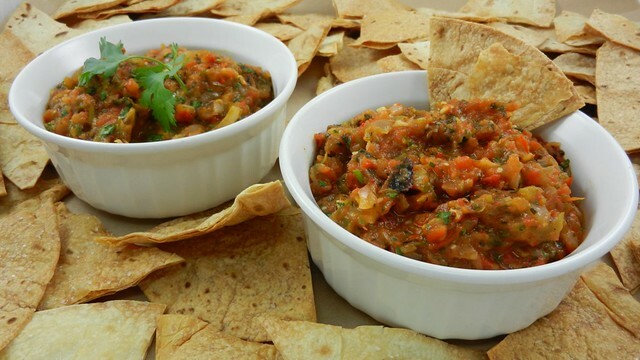 After a few minutes, you’ll have a simply amazing thick salsa. 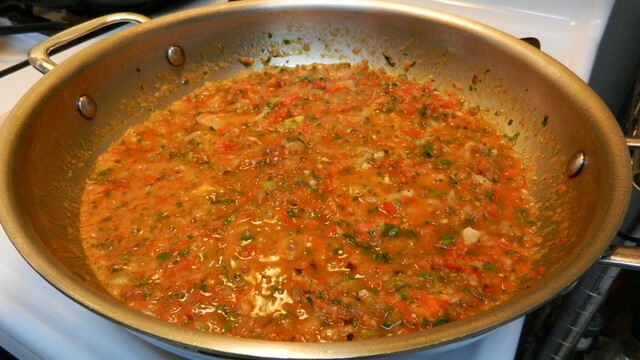 Once the salsa has thickened, set it aside to cool a minute before the next step. Chop the remaining cilantro and add to the salsa. Decide how much heat you want in your chip adornment and try to get a feeling for how many people are going to want spicy salsa and how many are going to want mild. A smart bet is to just divide the batch in half and then add ground ancho chili to the mild and ground chipotle for the spicy to taste. If you know you want super hot salsa, use a chipotle pepper packed in adobe sauce. I just prefer ground chipotle for salsa because it’s easier to control the heat. 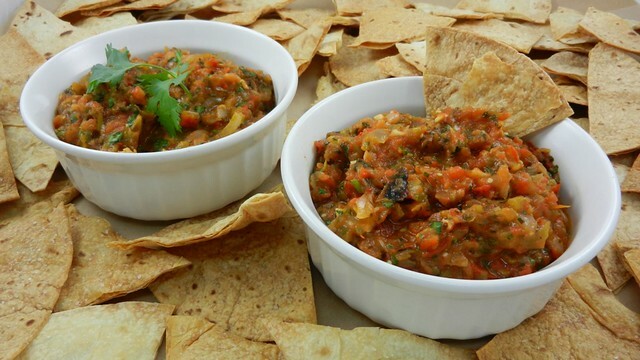 Serve with your favorite chip, or since you’re already making homemade salsa, go ahead and make your own chips. Grill until the tomatoes have wilted and you have a good char on all of the vegetables. Set aside to cool for a couple of minutes. Cook until thickened, stirring frequently. 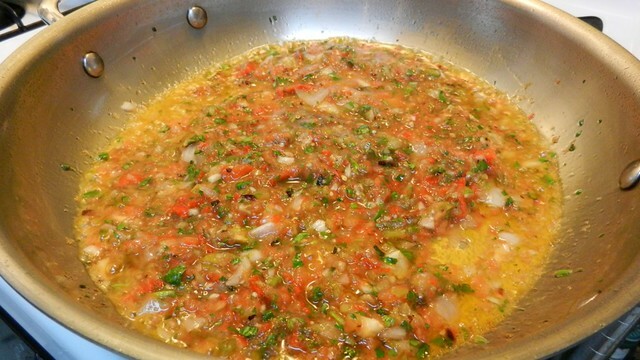 After a few minutes, you’ll have a simply amazing thick salsa. 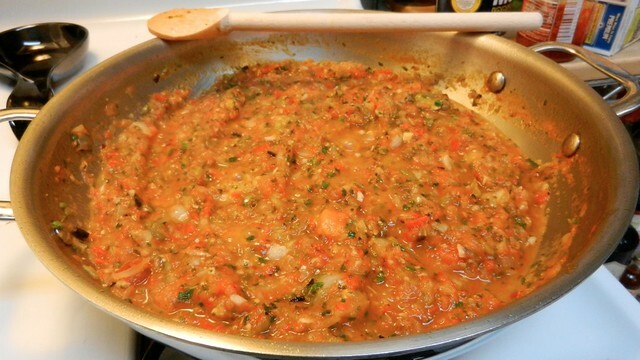 Once the salsa has thickened, set it aside to cool. 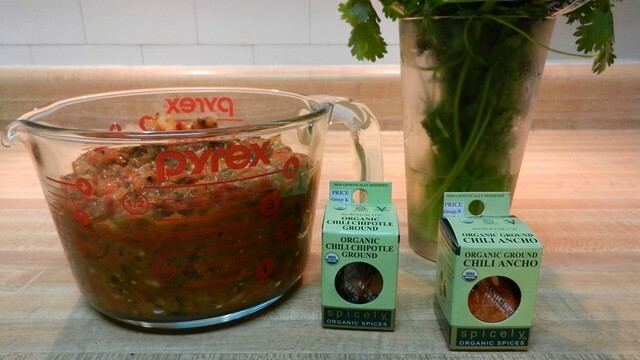 Salsa is great just from the blender without the extra steps if you don't want them. 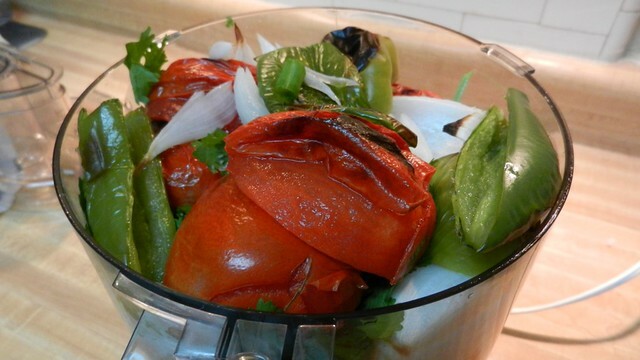 I roast vegetables several times/week for supper, yet it never occurred to me to roast the veggies for salsa. The color is gorgeous & I love the addition of ground ancho chili & chipotle. It looks delicious!